Follow Allan’s path of self-discovery, and watch him take back what he’s lost. Surviving the Improbable Quest is a spine tingling adventure, with exciting twists & turns. A perfect and inspiring read for 10 and up. I’m inspired by crowded malls, streams that barely trickle, patches of moss, charred forests, and distant mountain ranges. The clacking of keys can be heard throughout my home late at night and I’m always drawing, inking or painting. To date, I’ve written 4 books and illustrated a handful more, and I’ve only begun to speak. Allan Westerfield’s day goes from bad to worse when the principal tells him that his math score disqualifies him from competing in the state swim meet but if Allan wins he will not say anything. Then Allan wins the swim meet yet his math teacher explains how he can’t compete and Allan is disqualified. On the way home, Allan’s parents are clearly upset with him. They are arguing when they are in a car accident. Allan wakes up to learn that his parents died in the accident and he is now a paraplegic. Allan is resentful of the situation and refuses to talk to anyone, even his uncle Rubic his caregiver. Rubic is trying his best but it’s clear that both need a break so he sets up a fishing trip for Allan and himself. But a sudden flood has the trip taking a dangerous turn and it is up to Allan to get help for his trapped uncle. But on the way Allan notices strange creatures and finds himself about to be a slave and completing a quest. I really enjoyed this story. Allan just wants to have an adventure and is not ready to apply himself to school. Then when he loses his parents you can completely understand how he is resentful about the whole situation. He really needed the retreat and the subsequent adventure to kick him in gear. I loved watching him grow stronger as the story went on. Although Allan was difficult at the start I can to care for him at the end. This is a great story and the first in a series. I can’t wait to see what Anderson Atlas come up with next. 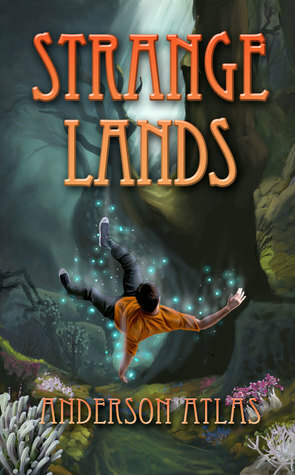 I received Strange Lands from the author for free. This has in no way influenced my opinion of this book.